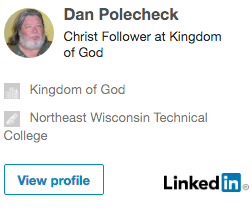 My name is Dan Polecheck. I am 67 years old and married to a wonderful lady. I have two children and four grandchildren, which are the pride and joy of my life. I am a Christian and an active member of my church, where I find great peace and love from my church family. I am a US Navy Veteran and Vietnam Era Vet. Due to a service-related injury, I found that I was no longer able to hold down a job that required any amount of physical labor. At this point, I decided to apply to the Veteran’s Administration for Vocational Rehabilitation. I was accepted and went back to school for Web Development and Design. I never thought that I would be going back to school in my 60’s but there I was. I enjoyed it, even though it may be some of the hardest work that I had to do for some time. I graduated in 2012 and started my own website company. I maintain several different blogs on different topics. Trying to get over the horrors of Vietnam I started to write poetry. It took me almost six years to write my first poem which you can read here. I have also started a blog about Vietnam. You can view that blog here. As I mentioned, I am very involved in my church and have started a Christian blog which can be viewed here. Well Hello Crusty Old Sailor! I enjoy your posts and reading your blogs. 🙂 I will have to tell one of my friends about you – she manages 8 different blogs and a full time job! I’d welcome any tips, suggestions, and advice you have. Thank you for your commitment, dedication, and service to our country!